I just wanted to share the smiles. Jane and Lynn recently took my Beginner's Watercolor Workshop. Here they are with the paintings they did during the day. Great job ladies! 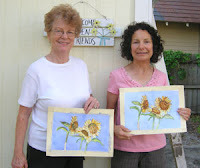 To learn more about my local classes, visit my website: http://watercolorworksart.com/Classes. There are several classes to choose from, and we have a wonderful time. New series of classes begin the last week of March, 2009.